Solar Pool Heating Systems: Economical and Low Maintenance! Solar pool heating systems save you money and make life easier! If you have a swimming pool, solar heating can can significantly reduce heating costs compared to gas or electric heating and minimize maintenance costs compared to conventional systems. 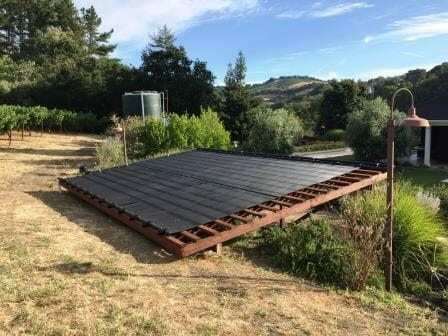 With few moving parts and durable, proven construction, the panels we use are built to endure, with a 12-year full warranty and a limited lifetime warranty. Gas and electric pool heaters, by contrast, need to be replaced every seven to ten years. Spend more time swimming and less time worrying about your pool heating system! If you have a pool, you probably know how much keeping it warm adds to your monthly utility bill. Consider this… According to an article in the Appraisal Journal, for every utility bill dollar saved annually because of an improvement, homeowners gain $10 to $20 in property value. So, by reducing your electric bill by $1,300 in the first year, you could increase your property value by as much as $26,000. Why the increase in value? Homebuyers are willing to pay more for homes that promise clean, reliable energy savings. 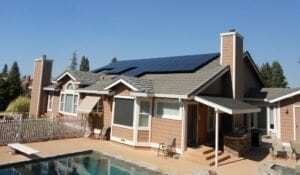 In some communities, a home and pool outfitted with solar energy systems could sell much faster than other homes. Solar pool heating makes sense to install at the same time your house is outfitted with a full solar power system. It saves you time and may reduce the cost. We have found that many of our customers also have pools. Often they ask us to add solar thermal to heat their pool at the same time as they are installing solar for their home. For these customers, we install Heliocol systems—which are among the best in the industry. One big advantage to our Heliocol system is that they have a patented connection system that eliminates the ugly band clamps that many other thermal companies use. Heliocol’s system also does not require frequent tightening of the connectors as required with band clamps, and it has an industry leading 12-year warranty. Solar thermal can be installed on roofs, or we can fabricate a ground support system when space or shading limits roof options. Ask our Solar Advisors to see if a solar thermal system is right for you. We recommend installing variable speed pumps with our solar thermal systems for pools. A variable speed pump can pay for itself in 2 years when compared to a fixed speed pump based on energy savings. Variable speed pumps can also be much quieter than a fixed speed pump. If you have an existing pool thermal system, we can replace your fixed speed pump with a variable speed pump when you go solar. A variable speed pump can also reduce the required size of your main solar power system, saving you more money overall! 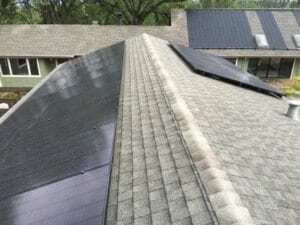 “I had a difficult installation including a solar pool system on a three story roof. Although it took a while to work out some bugs, Solar Universe persisted and even did some additional work at their cost to make sure the system worked as planned. “The service and installation was outstanding. Paul K and the Suntegrity Solar team accommodated all the needs for my solar system and I appreciated his personal attention to the system that was installed.